“You’re going to be alright,” I glanced down and whispered to a broken man struggling through an ice climbing nightmare. My eyes darted quickly between the Korean rescue worker helping to stabilize the stretcher, over my shoulder at the fifty feet of steep ice awaiting our descent, and back to the contorted face of the injured climber. “We’re almost down, you’re very tough.” “Thank you,” he murmured back. How I ended up rappelling down a steep ravine, belay device in my left and a stretcher in my right, is an intense story that offers a valuable lesson. Adventure sports can be unpredictable and dangerous; this fact makes prior preparation and training paramount. Sparky and my brother, Adam, practicing building ice anchors. 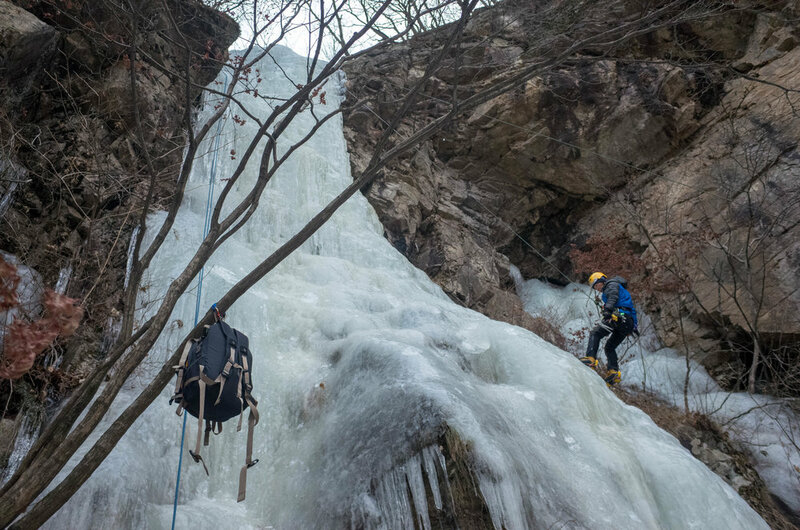 The day began as one might expect, four friends eagerly awaiting the chance to explore a remote corner of the Gyeonggi Province of South Korea and test their mettle on the day’s gift, a hidden frozen waterfall. Sparky, with almost fifteen years of ice climbing experience would lead the climb. While Matt, Kristine, and I sought to bolster our burgeoning knowledge of the sport. After a twenty minute morning jaunt along a mountain valley, we began searching past the bare trees for the frozen climb. Atop the south side of the valley, I could make out the gleaming ice fall. To reach the approximately forty foot wall, we’d have to ascend seventy meters of a 45 to 60 degree icy couloir. From the valley floor, I noticed what looked like three climbers, one of whom seemed to be resting atop the steep ravine, smoking a cigarette. As we climbed upward, I realized the stillness of the situation was misleading. With each vertical step it became more apparent that something was wrong. As we reached the top of the ravine, I asked the sitting climber, “are you alright?” In broken English, he replied, “My ankle is broken, I’m fucked, man.” He had taken a bad fall while leading the climb and came to an abrupt and painful stop atop the steep icy ravine. This rescue was going to be a nightmare. The icefall two weeks after the rescue. No sooner had the conversation ended, we heard several Koreans calling from the valley floor. In quick response, the injured climber shouted, “yoegi yo (up here)!” From our perch, we watched as an orange clad rescue team of five men slowly emerged and began plodding through the deep snow. As they began their icy ascent it became apparent the rescue team lacked the proper equipment for a rescue of this difficulty. Without crampons or spikes, their boots were no match for the icy terrain. While they slowly climbed, we prepared to assist by anchoring our gear, donning harnesses, crampons, and boots. Sparky worked quickly and started constructing an ice anchor in order to rappel towards the climber. As requested, we passed an extra rope to the rescue team as they slid towards the injured climber. Aided by our rope the rescue team provided first aid and strapped the climber to the stretcher. Upon removing his boot, blood seeped down the ice and painted the ravine crimson. Severely hampered by the language barrier, the rescue team attempted to do all of this alone. To my horror their evacuation plan was to strap the injured man to the stretcher, attach a rope and slowly lower his body down the couloir neglecting to stabilize or keep the climber’s broken leg from painfully dangling. With each jostled inch his groans grew louder and blood trickled further. Having finished his anchor, Sparky sprang into action. He quickly rappelled towards the climber. Matt and I followed close behind. Using ice screws, Matt and Sparky built two sturdy anchors to counter balance and stabilize the stretcher. I helped the rescue team treat for hypothermia as the injured climber began shivering uncontrollably. Upon completion of Matt’s and Sparky’s anchors, we were ready to continue lowering the injured man to paramedics on the valley floor. As Sparky top belayed, a Korean paramedic and I rappelled the stretcher down the steep frozen ravine. As we lowered him, the climber expressed his gratitude for the entire team’s efforts. He was broken and cold but now safe in the hands of a trained medical team. The last thing he told me was, “the same thing happened to my other leg fifteen years ago, I’ll be back.” After passing the climber off to the paramedics, we ascended and practiced building anchors, rappelling, and rescue techniques. There’d be no ice climbing that day. In the weeks after aiding my first emergency rescue, I began contemplating the price of adventure sports. Before pointing your skis downhill and shredding your way into the world of adventure sports, be wary of this vital fact: the sum total of your group’s experience and training will directly impact the safety of you and every person you interact with while completing your task. A baseline level of expertise shouldn’t be the end goal. Instead seek out classes, certifications, and mentors that prepare you to respond to the unknown. These are factors that we often overlook while planning adventures. Take a mountain rescue or medical course. A first aid kit and basic medical knowledge should be a baseline. Did we expect to stumble upon an injured climber with a compound fracture—all while facing a language barrier? Nope, but thankfully as a group our level of preparation allowed us to respond to the situation. Never forget that although adventure sports and their remotely rugged arenas can bring great joy, the possibility of immense pain continually lurks in the shadows. All adventurers need to understand this dichotomy. Respect the mountain, the climb, and the journey and realize that if you aren’t prepared both mentally and physically, a small mistake can lead to great tragedy. In the end we must be at peace with the fact that in the midst of our efforts, there is an inherent and undeniable risk that can never be fully managed. But don’t let that keep you on the couch! Find a partner, do your research, practice, and begin adventuring! Interested in reading more outdoor survival stories written by People of Color? Check out "Grief, Trauma and Loss in the Outdoors" , "28 Days Later" and "The Joys and Dangers of Solo Backpacking."